The days of simply asking people to join your email list and having them actually do it are long gone. Also, having your own newsletter and expecting people to flock to sign up for it isn’t going to work either. Both involve volunteering to receive more email, something roughly nobody wants more of! Smart marketers have learned, however, that people WILL subscribe to your list if you can provide them something of value in exchange for their email address. That “something of value” is a called a Lead Magnet and I am going to show you how to check your lead magnet for GREATNESS in 60 seconds! This time last year our company, Boom! Social, had a pretty tired list of 23,000 or so email subscribers and was growing at roughly 500 new subscribers a month. That was okay, but hardly stunning. Leading the way was our “27 Killer Facebook Post Ideas for Small Business Owners” guide that netted 43,000+ new subscribers. Not all of our lead magnets were winners though. We have had a few flops along the way. However, every time we failed we asked “why” and make sure we didn’t make the same mistake the next time. After 15 months of doing this we have become pretty good at knowing what will work and what won’t. We thought we might be able to help you save a little time and grief by sharing with you the things we check every Lead Magnet for every time we build a new one. What Every Lead Magnet Must Do to be GREAT! Provide Value: It sounds like common sense, but your Lead Magnet must provide value to the person asking for it. Value is not just more information, but information that your new subscriber can actually use to make a change, even if it just a small one, in their business. Speak to a Single Pain Point: Think of a Lead Magnet as an appetizer, not a main course. It should solve, in a very simple and elegant way if possible, one and only one problem. We have learned the hard way that giving away too much actually hurts conversions. Relates to Your Products and Services: The primary job of a Lead Magnet is to get new email list subscribers, but that doesn’t have to be all that it does. It can also be an interest generator for your other products and services without being salesy at all!I can illustrate you how to do this by tying the first three items on our checklist together.The “27 Posts” Lead Magnet I mentioned above worked great because it provided value by teaching people one thing, how to get more free reach on Facebook. For 82.3% of the people who downloaded it that was enough. However, 17.7% of the people wanted to not only get more free reach, but really how learn how to own the Facebook news feed. In fact, over 7,600 people who took the FREE offer bought the PAID “Dominating Facebook’s News Feed” course we offered shortly thereafter. Be Actionable: People can get “theory” just about anywhere. What they can’t get are actionable “to-do’s” that help them move the ball now. Give them THAT and they will be a subscriber and remember you a very long time. Be Easily Received: When you are offering something for free and somebody asks for it, give it to them! Don’t make people wait hours or days and complete several more steps to get what you promised them. It’s just insulting, deceptive and a bad way to make new friends. That doesn’t mean you can’t show them an upsell video sales letter, just make sure they know what they asked for is on the way, or that they can close out of the upsell and get what they asked for immediately. Look Nice: It has never been easier to create great looking Lead Magnets. We use Canva for a lot of our graphic (and an awesome free ebook template) and PowerPoint to create our Lead Magnets. Both are inexpensive, easy to use and provide great looking results quickly and easily. 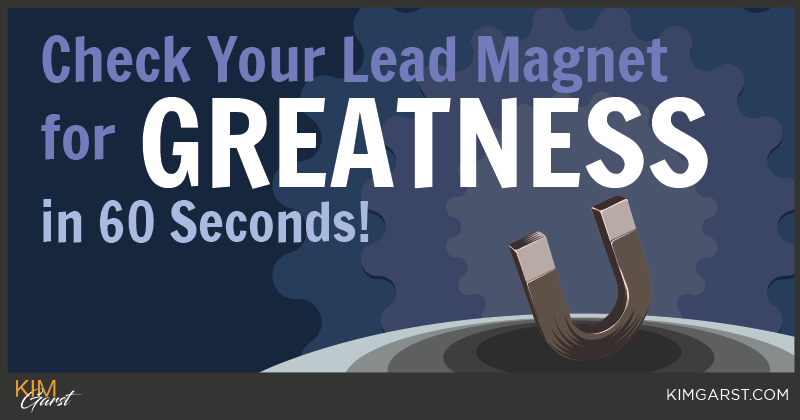 So there you have it, a very easy way to check your Lead Magnet for GREATNESS in 60 Seconds! We took the liberty of turning the information in this post into an easy-to-use checklist. You can get your free copy below! 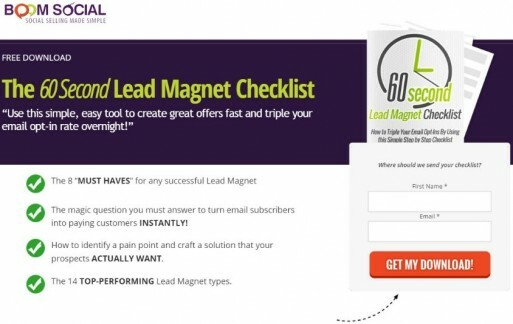 And, before you ask, yes, we did indeed use this very 60-second checklist to make sure we had built a GREAT Lead Magnet! Thank You Kim For Sharing this info. As a new Blogger this has been my biggest issue to overcome. Finding the right ideas and products and mailing opt in service to use. This is a great post and Service! Thank you again!